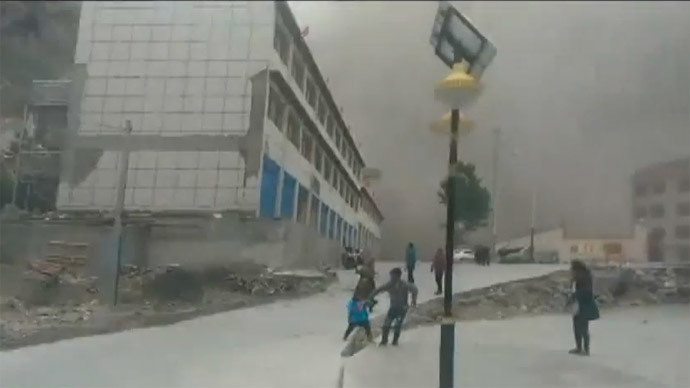 Dramatic footage has emerged showing the moment Nepal's deadly 7.8 magnitude earthquake jolted neighboring Tibet. Huge clouds of dust are shown in the video as residents scream and run for safety. The power and intensity of the quake is apparent in the shaky footage – which was filmed on a resident's cellphone – though the site of the video was located 400 kilometers (249 miles) from the epicenter, according to CCTV. Some residents seem initially confused at the noise and clouds of smoke, while others run for safety. A man – presumably a father walking hand-in-hand with his daughter – grabs his wife and leads his family away from the area. At least one other person can be seen filming the disaster. A second blast of noise and smoke clouds later hits, prompting more alarm. The deadly quake hit Nepal on Saturday. Most of the damage could be seen in the capital Kathmandu, as buildings collapsed and left people buried under the rubble. At least 4,400 were killed in the disaster, though the country's prime minister says the death toll could reach 10,000, as information from remote villages has yet to come in. Eight million people have been affected by the quake – more than a quarter of Nepal's population – according to the UN.